Event organisers had hoped to see sides from Nauru and Melbourne Vietnam, but unfortunately they were unable to attend due to costs and player availability. The competing teams in 2005 are Japan (see earlier story for squad details), NT Indigenous Development Squad, an NT Super Rules team and the NT Crocodiles. Matches are 4 x 15 minutes (no time on), and squads of a maximum of 27 players. 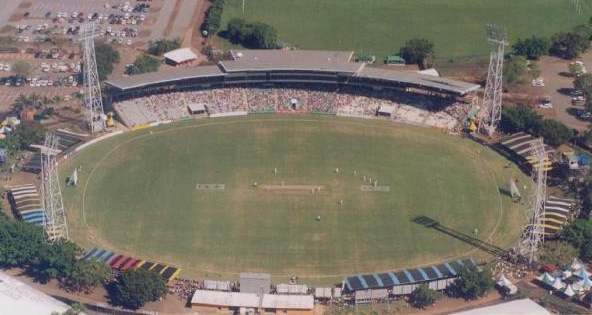 The games are on at the Marrara Sporting Complex, scene of the opening ceremony and a fully flegded Aussie Rules oval (pictured), having hosted AFL matches previously, including a home-and-away match in 2004. All the games for the tournament are being played as double-headers in evening time slots. Balmy temperatures of around 30 deg Celsius are expected all through the tournament. The Opening Ceremony saw the stadium packed with spectators for the traditional Olympics-style introduction of athletes - that alone would be a wonderful experience for all the players. In the first round (Sunday 15th May), Japan took on the NT Crocodiles at 7pm. The Samurai jumped out to a great start, perhaps surprising their Australian opponents, kicking 4 goals 3 behinds to no score in the opening quarter. They were never threatened after that, winning by 40 points. In the earlier match, at 5pm, the NT Indigenous Development Squad smashed the NT Super Rules side, winning by 125 points in the shortened format. World Footy News will try to find out more about this side, but obviously it's packed with talent. Next up could be another win for the Samurai, with Japan vs NT Super Rules, and in the other match it's Indigenous Dev Squad vs NT Crocs, both on Monday night. More details on the games can be found at the Arafura Games website.